Okay here we go, in no particular order. When its hot outside you sweat, when its cold you shiver to increase heat and you sweat. No matter the weather you will have fluid loss. So regardless of the climate, you have to drink water to make sure you don’t get dehydrated. Why do you need to hydrate though? Sweat and its evaporation from your skin allow your body to cool. Not having enough water to sweat means your body temperature won’t be well regulated. Heat Stroke is a huge problem, and it often occurs in athletes that workout outdoors under the glaring sun. Let’s not forget the importance of body temperature control in the elderly. The elderly cannot handle heat as well as younger adults, mainly because they have more water losses from their kidneys, and they also tend to drink less water to begin with. 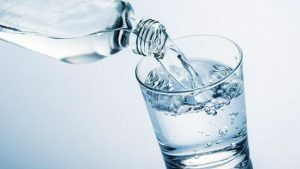 Important thing to remember here, you may not feel thirsty while you work out.. that does NOT mean you shouldn’t drink water anyway! Plus, your muscles need blood to work to their full potential. Low water intake, means lower amount of blood getting to your muscles so they don’t work as well, as strong, as long. Dehydration can lead to loss of concentration, short term memory, and even motor skills can take a hit. It can also make you very irritable. Sound a lot like the effects of sleep deprivation. Drinking water will also wake up your mind! You will feel more aroused……Mentally! Come on get our mind out of the gutter ha! In the elderly, dehydration can increase the risk of delirium or confusion. This is basically a fluctuation in mental status of an older person. It’s even more important in the elderly that are very ill. Just keep that in mind. Dehydration can cause headaches. So if you’re having one and you haven’t had enough water… drink some! See if that helps before you go straight for pills. Not all headaches are bad, and not all headaches are good. So if you’re experiencing severe headaches don’t just self-medicate and drink water. Make an appointment with your doctor and get yourself checked out. I’m a huge fan of healthy skin and doing things for the health of your skin. It’s the first line of protection against any infection and anything else in our environment. So treat it well! The water in your skin helps it keep its elasticity and radiance. Many think that being hydrated will prevent wrinkles, but actually, it’s hydration in addition to moisturizers that can do the trick. Just being hydrated is not enough to prevent the effects of our environment, the sun, the air etc. Dehydration can play a role in formation of kidney stones. Not pleasant. I had a few patients say it was like giving birth. They were males so what would they know, ha! but I guess peeing out a stone too large is as close to birth and they can get. Hydration can also prevent urinary tract infections (UTIs). Also, don’t hold your pee! If you do this it can increase your risk of a UTI, so try not to if you can help it. Keep Calm and Drink More Water! Next articleI’m Bananas For Bananas, Wanna Know Why?